LOWELL, Mass. – In addition to seeing Michael Kopech’s start on opening night for the Lowell Spinners (Link), I also saw the following four games at LeLacheur Park. Some scouting notes on other members of the Lowell pitching staff—which is as good as I can remember it being in some time, and that’s even before it receives an influx of college pitchers from the 2016 draft—follows here. - Athletic right-hander Kevin Steen is back in Lowell after seven starts with the club to end 2015. He got off to a solid start, throwing five shutout innings, striking out four and allowing only two hits and two walks in his season debut on Monday. Steen’s stuff is still on the light-side, as his fastball sat 88-90 mph, topping out at 92. The pitch is straight, but save for the third inning, when he walked back-to-back hitters, he did a good job controlling the offering. He also showed what looked like a two-seam fastball at 86-88 mph with arm-side run. Overall, he got seven swing-and-misses with his fastballs, including three of his strikeouts. Steen’s best secondary offering is his curveball, which flashed solid-average. The pitch has long, 11-to-5 break at 72-74 mph and he has strong feel for it. Steen also showed a changeup at 83-85 mph, but it was on the firm side and lacks separation from his fastball. 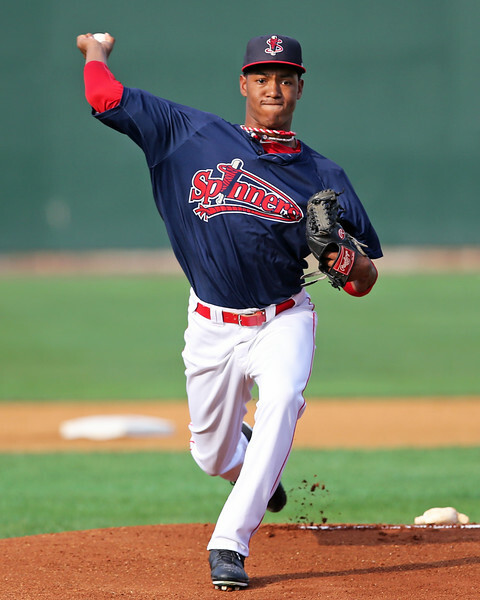 - Left-hander Enmanuel De Jesus showed impressive poise in his first start of the year on Sunday, throwing 6 2/3 shutout innings. De Jesus has a solid pitcher’s frame with some projection remaining. He sat 89-91 mph for his first few innings, but his velocity dropped the deeper he worked into the game, ending up at 87-88 mph. De Jesus showed feel for both his changeup and curveball, but also tended at times to slow his delivery and arm down on them, telegraphing the pitches. His changeup came in at 78-83 mph, showing fade and late drop at its best. His curveball came in at 67-72 mph with long, slow break. It was on the loopy side at the lower velocity range, but at 71-72 mph, it had more depth and tighter rotation. - After spending three seasons in the complex leagues, Algenis Martinez finally made his way up to Lowell and showed improved stuff on Sunday compared to what we saw in Fort Myers this spring. Martinez’s velocity has increased, sitting 92-94 mph and topping out at 95 with finish and cut compared to the 90-93 mph we saw in Spring Training. He mixed in a slider at 82-87 mph with short, vertical break in the upper velocity band and longer break with some tilt at lower velocities. 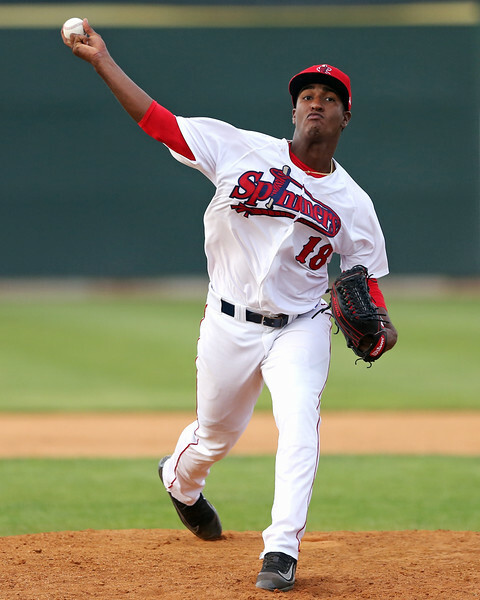 - Now in his third go around in Lowell after spending the first month-and-a-half of the season in Greenville, right-hander Dioscar Romero shows decent stuff, but faces a long road to establish himself as a prospect. Romero has a large, soft body with no physical projection. He throws over the top with an arm-heavy delivery and already has a Tommy John surgery on his resume. Romero’s fastball sat in the low-90s, topping out at 95 mph over two looks during the home stand. The pitch is on the straight side, especially when up, but it did miss bats, particularly during his outing on Friday. Romero will mix in a short, vertical slider at 83-85 mph and a changeup at 84-86 mph. The changeup showed the better of the two secondaries, flashing late fade down and in on right-handed hitters. 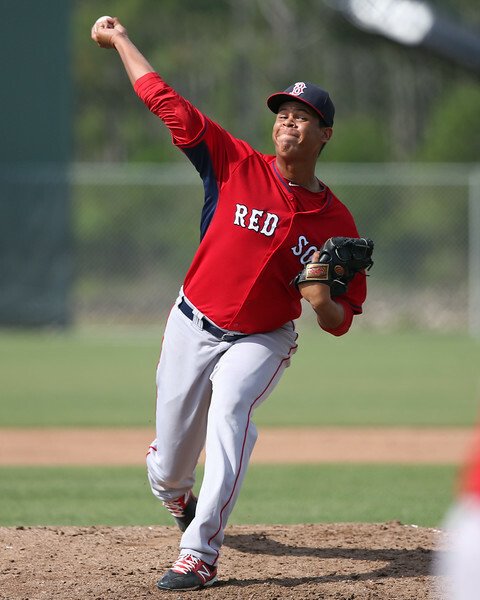 - After also starting the season with Greenville, right-hander Daniel Gonzalez finds himself back in Lowell after spending last season with the Spinners. While he has good size for a pitcher, the stuff does not match up. Gonzalez sat 86-88 mph in a piggyback role—although it seems that he will take Kopech’s spot in the rotation. There was some run on the fastball, but the pitch lacked life. He showed feel and confidence for his 78-81 mph changeup, with the pitch showing fade. He also mixed in a slow, loopy, 12-to-6 curveball at 69-71 mph.